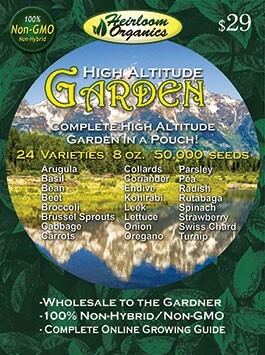 Finally, by popular demand, a special High Altitude Garden is available from Heirloom Organics. This inexpensive complete high altitude garden contains the specific varieties you need to successfully garden vegetables and herbs above 3000 feet. Gardening at elevations of 3,000 feet and higher in America’s mountainous regions presents unique challenges. The high country gardener must use varieties that have proven successful at high elevations. The Heirloom Organics High Altitude Garden contains 24 varieties, 8 ounces and over 50,000 seeds, providing you with Wholesale quantity of seeds in a complete, inexpensive Garden in a pouch. For a high-altitude garden you need varieties with the shortest "days-to-maturity" numbers for your garden. Leafy greens and root vegetables - carrots, turnips, parsnips, radishes and beets - are the best choices for high-altitude, short-season gardens. Beets and turnips are also a good source for tasty, early season greens. The best way to get a jump start on the growing season is to start your seed indoors well ahead of last frost. Our free, complete online growing guide for seed starting will ensure your success.